A pocket-sized principality in the heart of Europe, Liechtenstein rarely tops anybody's bucket list of continental must-sees. Yet this tiny, landlocked nation offers more than you'd imagine: from long-standing history to sky-high mountains; cliff-hanging castles to odd cultural quirks. Many of Liechtenstein's historical highlights are located in the capital, Vaduz. While this tiny town may only have around 5,000 inhabitants, it also boasts an array of fascinating museums and galleries – including the Liechtenstein National Museum, the Museum of Fine Arts and the FIS Ski and Winter Sports Museum – as well as the atmospheric Prince's Wine Cellars and the neo-Gothic Vaduz Cathedral. All these attractions are watched over by the pretty Vaduz Castle, which remains the official residence of the Prince of Liechtenstein. Vaduz isn't Liechtenstein's only town of historical note. The second town, Schaan, is actually larger than Vaduz, and comes with its very own impressive church and Roman remains, while Balzers in the south west boasts what is perhaps Liechtenstein's most arresting fortification. There are also beautiful chapels to be found in lesser-visited villages like Triesen and Planken. And yet the true star of Liechtenstein is the remarkable nature. This country has arguably the most impressive landscape in Europe. Most of the peaks in Liechtenstein soar more than 2,000m (6,562ft) into the sky, making Liechtenstein a premier destination for skiing, hiking and mountain biking. Its shimmering lakes are also a big draw for swimmers. As well as its permanent attractions, Liechtenstein also excels when it comes to unusual events. Some of the fun annual highlights include the Monster Concert (where troupes of musicians and dancers dress in outlandish costumes and bang drums), the Cattle Drive (where cows and sheep are festooned in colourful garments and adorned with bells) and the LGT Alpine Marathon (where competitors from around the globe run for 26 miles through the mountains). Factor in Liechtenstein's dynamic dining, drinking and live music offerings, and you have a pocket sized nation that punches well above its weight. 160 sq km (62 sq miles). Imperial principality with a hereditary constitutional monarchy. Prince Hans Adam II since 1989. Prime Minister Adrian Hasler since 2013. The British government is not represented in Liechtenstein. However, consular support to British nationals can be provided through the British Embassy in Berne, Switzerland. British nationals make 2,200 visits to Liechtenstein every year (source: Liechtenstein Office for Statistics). Most visits are trouble-free. 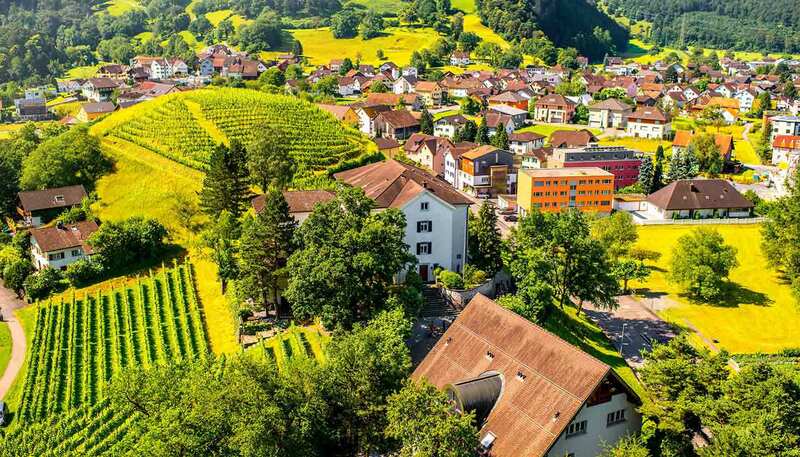 If you’re living in or moving to Liechtenstein, visit our Living in Liechtenstein guide in addition to this travel advice. If you’re travelling to Liechtenstein to do business or provide services, see further guidance on providing services in Liechtenstein after EU Exit. If you need to contact the emergency services, call 112 (general emergency calls), 118 (fire), 117 (police) or 144 (ambulance). Although there is no recent history of terrorism in Liechtenstein, attacks can’t be ruled out. Crime levels are low, but petty crime can occur. Take sensible precautions to protect your passport and money, and be alert to pickpockets in public places. Do not become involved with drugs of any kind. The emergency number for the police is 117. Foreign visitors and residents can be targeted by scam artists. Scams can cause great financial loss. If you receive an e-mail claiming to be from Her Majesty’s Revenue and Customs (HMRC) offering a tax refund on provision of your bank details you should make absolutely sure that it is not part of a scam. A full (i.e. not provisional) valid UK, or other EU/EEA, driving licence is sufficient for driving in Liechtenstein. If the UK leaves the EU without a deal, you may need to get an International Driving Permit (IDP) to be able to drive in Liechtenstein and other EU/EEA countries as a visitor. If you’re living in Liechtenstein, check the Living in Guide for information on requirements for residents. If you plan to travel to Liechtenstein via the motorways in Switzerland or Austria you must purchase and display a motorway vignette or face large on-the-spot fines in these countries. All road users should follow instructions given by local police and officials on the main alpine transit routes, at bottlenecks and areas of heavy traffic congestion. A warning triangle is compulsory and must be kept within easy reach (not in the boot). Radar detectors are prohibited in Liechtenstein whether in use or not. The limit for alcohol in the bloodstream is 0.8% and police may request any driver to undergo a breath test or drugs test. Traffic regulations are strenuously enforced. Any serious breach of the regulations can result in heavy fines and/or imprisonment. Alpine winters often make driving more difficult. You should equip your car with winter tyres and snow-chains, and check road conditions prior to departure. See the RAC and AA guides on driving in Liechtenstein. Many accidents happen due to insufficient information, inappropriate equipment or overestimating your own capability. Follow advice given by local authorities and guides, take note of weather forecasts and conditions, make sure you are physically fit and have the necessary experience, be in a team of at least two, inform someone of your plans, take warm clothes and wet weather gear, and use sun block and sun glasses. Read more about how to stay safe on the slopes. Although there is no recent history of terrorism in Liechtenstein, attacks can’t be ruled out. You should be aware of the global risk of indiscriminate terrorist attacks which could be in public areas, including those frequented by expatriates and foreign travellers. Switzerland handles immigration and customs matters for Liechtenstein. Entry requirements are the same as for Switzerland. There is no customs border between Switzerland and Liechtenstein. You should check with the Swiss Embassy in London what type of visa, if any, you will need. If you are planning to stay longer than 3 months, see our Living in Liechtenstein guide and contact the Swiss Embassy in London if you have further questions. UK ETDs are accepted for entry, airside transit and exit from Liechtenstein. If the UK leaves the EU without a deal, access to healthcare for British nationals travelling or living in the EU, European Economic Area (EEA) and Switzerland is likely to change. More information about healthcare for UK nationals living in and visiting Liechtenstein is available on the NHS website. The EHIC entitles UK visitors in Liechtenstein to reduced cost immediately necessary healthcare. If you claim treatment under the EHIC scheme in Liechtenstein you should only be charged the proportion of your healthcare costs for which you remain responsible. If you don’t have your EHIC with you or you’ve lost it, you can call the Department of Health Overseas Healthcare Team (+44 191 218 1999) to get a Provisional Replacement Certificate. The UK government has or is seeking agreements with countries on healthcare arrangements for UK nationals after the UK leaves the EU. The NHS website and this travel advice will be updated with further information on travelling to Liechtenstein as the circumstances change. If you’re living in Liechtenstein, you can also find more information on healthcare for residents in our Living In Liechtenstein guide. Liechtenstein has one hospital, the Liechtensteinisches Landesspital, in Vaduz. The Amt fur Gesundheit (National Office of Health) generally needs to approve your admission, except for emergency treatment. For more serious conditions, patients may need to be referred to a nearby hospital in Switzerland. If you need emergency medical assistance during your trip, dial 144 or 112 and ask for an ambulance. If you are referred to a medical facility for treatment you should contact your insurance/medical assistance company immediately.